A Drop of Fragrance and a Whiff of Attitude! It’s a regular day. You walk into that meeting, but today you are unusally reminded of your Dad. The image of him carrying you on his shoulders to grab your favourite ice-cream flashes in your mind’s eye; and you catch yourself wondering what’s different today. And then, it hits you. Your Dad wore the same perfume as the man talking in front of you. That was so your dad! A fragrance is something that enters as you enter the room but stays on long after you have left. A perfume can build strong impressions and associations about the personality and nature of the wearer. With so much science and psychology behind every fragrance, it’s a surprising (and sad) fact that most people reach out for the standard Dior or Burberry to top off their grooming process; with no Indian fragrance brands out there that help us scream out our uniqueness. That was when Ahalya Matthan moved in to fill the gap. A perfumer trained in fragrance and perfumery at one of the premium institutions in France., Ahalya Matthan was born and raised with frangrances surrounding her. With her family owning an incense-stick factory, this unusual choice of career was something she has never doubted. What started as a few home-kitchen experiments in 2006 brought Ahalya Matthan Creations to life and has organically grown into a business that encompasses two different retail lines- spa and hotel supplies and bespoke fragrance creation that includes fragrance-based lip dews, soaps, delicately-scented drawer-liners, massage oils, scrubs, bath and hair washes. Ahalya Matthan, more popularly known as Ally Matthan is already well-known as the co-starter of the now famous #100SareePact. This interview will give us a glimpse into the other folds of her life as an entrepreneur, a mother, a wife and several other roles that she fits into her life. Tell us a little about yourself, your background, your venture and your business partner(s). 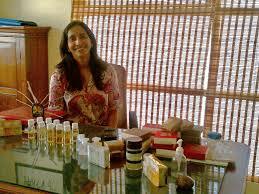 I’m a perfumer by profession – I finished my degree (MST) at ISIPCA, one of the foremost schools in the industry. I had always hoped to work in my fathers business but a series of events led me to setting up my own company Ally Matthan Creations Pvt Ltd, that deals with fragrances, bath and skincare products for the hotel and spa industry . Being a perfumer involves telling stories through the medium of fragrances: and this has what has always driven me! 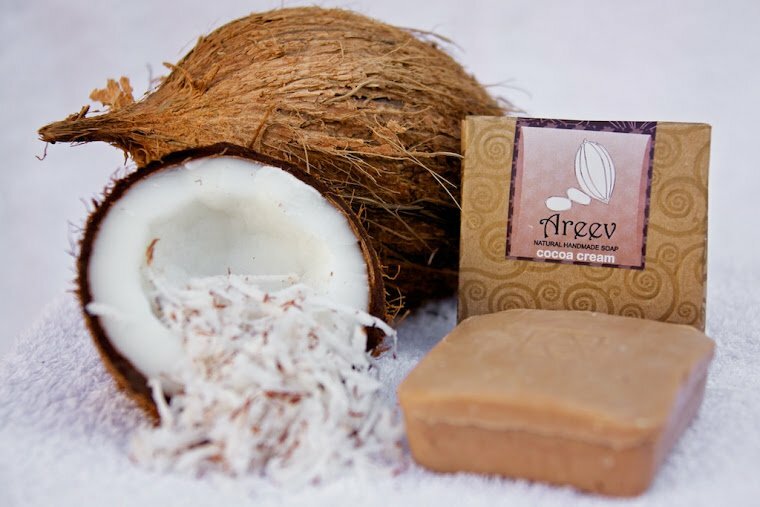 Areev a homegrown brand of natural and handmade products was set up about three years ago to cater to a demand that we felt had to be addressed. I was joined by my partner Apoorva Sadanand when it became evident that our small manufacturing facility needed to scale. Apoorva brings business expertise and strategy to an otherwise product oriented creation work space. What was the inspiration behind your start-up? Is your start-up an answer to some challenge you came across yourself? 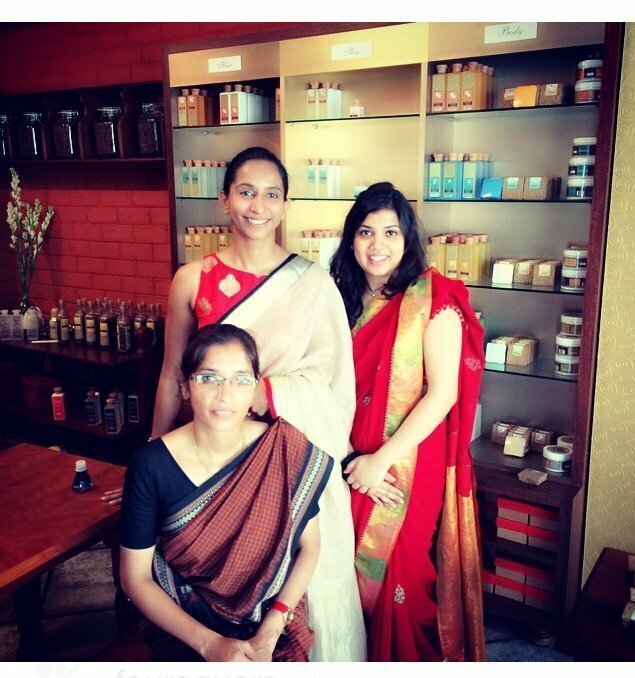 Ally Matthan Creations was set up to address the need for an Indian fragrance brand . In doing so we found that there was also a demand for quality bath and skincare products. Areev was set up at a time when I was trying to find bath products for my own child specifically – natural and interesting and local and products that he would relate to and enjoy.. My son just took more to products that were “food” related than herbal, ayurvedic etc. As a coincidence it directly answered the needs of hotel guests and customers who wanted to buy our products. The challenge here was creating a retail brand in an otherwise bulk and mass production facility. What led you to believe that this would be your niche? I have always been in love with fragrances – it was just a question of making them more readily available in products that can be used more frequently. Fragrance and product creation are the backbone of what we do – this is supported by years of work, study and intensive research and development with regards to ingredients and how they react with the body. Natural and Contemporary – an Areev product! What is your venture’s big picture? Do you believe you idea can change the world in some way? Our big picture involves a single road with two lanes – it is important to us to foster an awareness and acceptance of fragrance – we do this with our growing hotel and spa business. On a parallel we make quality natural, handmade, craft based and contemporary Indian productsts available to the regular customer, through Areev. Through Areev we believe that we can influence people to embrace a more natural, local and sustainable lifestyle. Bath and skincare routines are a part of our everyday life – its vital to use eco friendly , non carcinogenic ingredients. It s a bonus if your ingredients are locally sourced. Its more relevant to our lives if the product is contemporary in nature and resolutely Indian. Do you see the Internet as your biggest online partner? Yes, for two reasons. We are able to reach far more people from around the world than through traditional methods. Also because a small marketing budget goes a long way with a targeted audience. How big do you envision your Market size and reach to be? What is your revenue model? Who are your competitors? According to analysis and figures given by the Confederation of Indian Industries (CII), the total Indian beauty and cosmetic market size currently stands at US$950 million and showing growth between 15-20% per annum. After 8 years in business the key contributing factor to our revenue model continues to be hotels and spas. As far as retail is concerned online sales continues to expand the fastest. Areev is committed to selling natural, handmade bath and skincare products that are craft based and Indian while still being very modern and contemporary. The brand address functional issues while marrying craft to the product and presentation. For example : we have an age old traditional herbal oil infusion – the ingredients are all true and intact , we make them smell great (as opposed to Ayurveda) without affecting the functionality of the product . Our soaps are all natural and handmade but do not look craft although they are craft based and are of very contemporary fragrances – this is how we see todays India. How is your startup being funded? Are there any future plans of investments? Our business was originally funded by family. Since we began 8 years ago we have consistently put back far more into the business than we have taken out. At present we are investing in new technology for manufacturing as well as packaging – this is harder to do in the handmade and craft based sector as we have to keep these two priorities in mind always and adapt. As a result several of our manufacturing techniques are adapted food process and we are working on incorporating completely plastic free packaging in some of our products as well. What are the revenues and margins like in this industry? When is the Break-Even expected by? Industry standard though high are motivating. On an average the cosmetic industry revenues has grown by 20% consistently in the last ten years in India. Typically companies break- even within two years of starting. What are the current marketing efforts being incorporated? What do you see as necessary to take your business to the next level? When building a brand it is vital it focus on building a real and tangible relationship with our customers. Keeping this in mind we focus on one –to-one interactions be it in person or online. One quality customer is worth far more than ten disinterested others. Word of mouth is crucial and this is the back bone of our marketing strategy – a happy customer sells our products for us. At this stage it is important for us to deliver in terms of the brand promise and value. Also a growing brand it is important for us to absorb customer needs and work on supporting and answering these needs. What does your typical day look like juggling between mom responsibilities and owning a business? Personally I have a very routine bound day and it is hard to get me to move from my routine. My day starts early with exercise, getting my son to school and heading to work. I prefer taking meetings at out facility but sometimes with hotels and spas it is vital to go meet them. I am back home by the time my sone gets home. I do the whole extra activities roll with him and rely heavily on my laptop and phone to see the day through. We sleep early. I have also come to believe for anyone with children to work efficiently it is important to build a strong and reliable support system both at work and home. Which is why I know I would not be able to participate in my sons day without my partner Apoorva , our manager Daisy Nathan and dedicated people at work. Likewise I would not be able to go to work if it were not for reliable staff that keep the home fires burning. Also I depend heavily on my husband, my parents and my in-laws in times of contingencies – that meeting which I just have to go for! The biggest challenges for me are managing being in two places at the same time both mentally and physically. In important times ( school concerts, examinations or emergencies) it’s helps to remember that a child is best raised by a village. The hours that we put in as business owners at work does not end when we go home. Both my husband and I run our work, travel and leisure schedule around our son’s activities entirely. As a couple we have taken the decision that at least one of us will be present when the other is not. This involves considerable amount of planning and compromise to make things work as much as possible in everyone’s favor. What is your personal mantra for motivation? I am surrounded by incredible people: hardworking , enterprising, problem solving geniuses – one has no choice but to be motivated. I literally can count the number of people (2 ) that I know and are actively in my life that have a life of leisure. Our circle of friends are filled with working people trying new things all the time – food, travel, enterprise. My parents ( both in their 60s) are still very active in the workforce. My husband sets the bar (really high) for achievements . And the people in my work space are exemplary – punctual, ready to take the initiative and to a big degree risk takers. If I have to lead such people I must always have a challenging motive to inspire them to follow. This is what I tell myself everyday. What message do you have for other aspiring Momprenuers? As a working parent even if you feel guilt, or are sometimes subjected to emotional blackmail know this for sure: your children will always have solid values watching you follow a disciplined and dedicated work life. They will learn that work is a form of religion and therefore respect you more for it as they grow older. This is the best kind of role model you can be. As a working mother you will be raising self sufficient children – they will learn to get by without you on occasion, learn to be independent and learn how to occupy themselves without you. All great life skills. A few words about what you like about Kidskintha. AM: Kidskintha : I love the concept of learning through stories! I believe that this is something that can be enjoyed right through life – and Kidskintha for me embodies this. All child centric in an inclusive way – its important to treat children as individuals too and the website has some beautiful links that both children and adults can relate too. Can’t wait to get my son to join the Kidskintha family ! Ahalya Matthan can be reached at Ahalya@matthan.com and @ahalyamatthan on Twitter. If you are a Mompreneur with an inspiring story to share with hundreds of other moms, just let us know at kidskintha@gmail.com. We might just grab your story to be our next Momspiration! Devishobha Chandramouli is the founder of Kidskintha- a site dedicated to creating happy children. She believes that growing up well and happy is a function of growing up with well-informed adults. This site aims to deliver research-grounded and bite-sized pieces of information on two important facets of a child’s life- parenting and education. You can find her voice on the Huffington Post, Addicted2Success, TinyBuddha, Citizen Matters , Nectar and Lies About Parenting.